THE 300 SPARTANS has a loyal and affectionate fan base, chiefly composed of men who were little boys in 1962. That’s in no way a put-down. I was seven years old when I first watched this story of one of history’s most desperate and celebrated battles slash across the screen. Though I squirmed through the mushy love-story subplot, I was speared to my seat by the increasingly exciting fights between the thin lines of red-cloaked Greeks and hordes of wildly outfitted Persians. Long afterwards did my neighborhood friends and I re-enact these scenes in our back yards, using garbage can lids for shields and sticks for swords. Beyond swinging pretend weapons at one another, perhaps what made ‘playing Spartans’ durably satisfying was the clearcut notion of Good vs.Evil, the specialness of the underdog, the honor of doing the right thing against all odds—ideas that touched young sensibilities not yet attuned to history’s backstabbing, democracy’s fragility and any love that extended beyond one’s personal realm. 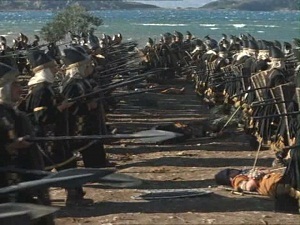 The movie tells the story —“across the hush of twenty-four centuries“—of the defense of a pass called Thermopylae. Mighty and ruthless King Xerxes leads “the whole of Asia” into divided Greece. It’s 480 B.C., and Persia seems unstoppable as she begins to conquer the West. Ancient historian Herodotus claimed Xerxes army numbered nearly three million, modern historians say it was more likely 250,000. Whatever, it was a shitload of dudes and as events reached critical mass all that stood in their way was a small collection of Greeks, headed by the personal bodyguard of the King of Sparta, Leonidas. And…today, we have the vote! Happily, watching this as an adult can still be fairly stirring, as the elements that thrilled young eyes have held up. This sadly ignored epic deserves some TLC. Directed by Rudolph Mate, the 110-minute saga arrived near the end of the cycle of spectacles set in ancient times, and was dismissed by reviewers while being poorly marketed by 20th-Century Fox. Handsomely produced for around $1,350,000, it features fine Greek location shooting by crack cinematographer Geoffrey Unsworth in rich color, and has some of the best costume design in the ‘toga genre’. Check out that Persian headgear! Note those cool shields the Spartans use, boldly embossed. The battle scenes feature convincingly fierce hand-to-hand melees, wilder than the highly praised climax of Spartacus. With five times as many extras—-this used less than 2,000—to parade across the screen, Spartacus evoked a sense of awe in Kubrick’s long shots, which evaporated into scattered stunts once all those Romans actually started to mix it up. In this movie the stabbing, hacking duel between the Spartans and the black-garbed Persian ‘Immortals’ thrusts you into some fairly harrowing circumstances. 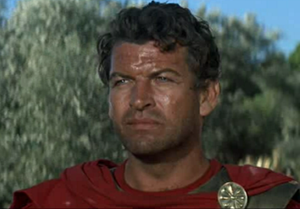 Cloak-deep in all the valor is star Richard Egan, as Leonidas. At his ruggedly handsome prime, age 40, Egan had his last good role here, and his stalwart presence anchors the human side of the drama. 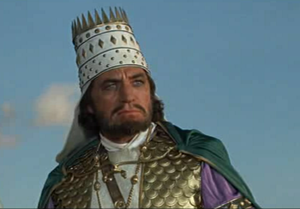 Matching Egan’s hero is David Farrar, having a wicked field day as Xerxes. These actors—along with broadly fun work from Donald Houston and an effortless prestige walk-through from Ralph Richardson– handle the adequate script steadily enough to make up for the gaping hole left by the clanging performances of Diane Baker and Barry Coe as the story’s romantic interest. There was a reason I plugged my ears through the sappy love story when I was a kid: it’s that these young co-stars are so gawdawful. Helping to patch the bruise left by Coe/Baker is a moving score from the premier Greek composer Manos Hadjidakis. His love theme is quite pretty and the march that propels the soundtrack is a rousing call to glory. At this point, raise a glass of Ouzo–to Richard Egan, Leonidas, lost youth and …the 300 Spartans.